Known for their loving relationship, Michael Miu (苗僑偉) and Jaime Chik (戚美珍) celebrated their 25th wedding anniversary with a grand, star-studded party. This was a surprise for Jaime which Michael had painstakingly planned since months ago, sparing no detail for the venue decoration. Many A-list celebrities attended the event, including Eric Tsang (曾志偉), Carina Lau (劉嘉玲), Andy Lau (劉德華), Raymond Lam (林峯), and Felix Wong (黃日華), Kent Tong (湯鎮業), Eddie Cheng (張兆輝), and Michael Tse (謝天華). Felix and Kent performed onstage together with Michael, singing Jaime a love ballad. Jaime was so touched by the efforts that she burst into tears and could not stop crying. Michael further expressed his appreciation for Jaime, “I have been so busy these years, constantly travelling everywhere for work. I’ve had a long winter and I would like to thank my wife for being there for me through every winter.” He added, “I also want to thank her for giving me such a joyous family!” Amid the crowd’s cheers, Michael and Jaime kissed. Reporters were pleasantly surprised to see Felix Wong and his wife, Leung Kit Wah (梁潔華) among the attendees. Since diagnosed with acute leukemia in 2013, Kit Wah has kept an extremely low profile. When Kit Wah was asked about her health condition, Felix immediately answered on behalf of his wife, “She is okay. This is the first time we are making a public appearance [after her illness].” Kit Wah confirmed she is feeling and said she has not been affected by the cold weather. The so called 5 tigers, it’s obvious Michael is the one that have aged the best…the rest looks old and haggard. Yup, he’s always been the yummiest one among them. Both the wife n him still look great compare to the others. To be fair, I think Tony, Andy, and Felix all age gracefully too, but in a different way due to their different styles and images. I think Andy, Felix and Tony still looks great. The only one that aged is Kent. Michael is of course awesome too! They are such a loving couple! So nice to see the reunion of all the TVB actresses and actors of the 80’s. I like Andy, Felix and Michael Miu the most out of the five. Actually, I don’t agree that the buzzhand article is a better one – it’s actually more biased….after reading it, sounds to me like some type of opinion piece from someone’s gossip column rather than an actual legitimate news source…. The Mingpao article is probably the best out of the ones I’ve read on this particular subject….or just go on the artists’ Weibos directly to see the pictures (Kent Cheng put up some good pictures on his weibo, as did a few other celebrities who attended). Congratulation to Michael andm Jamie!!! Wish them many more years of love and happiness! 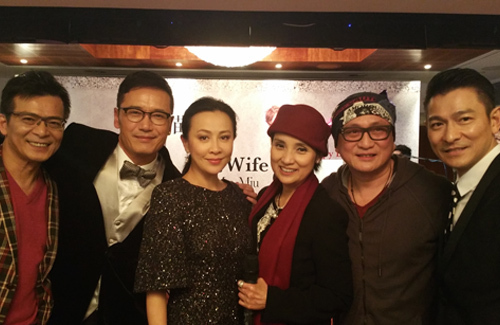 It was an “almost” reunion of the 5 Tigers, since Tony Leung wasn’t there due to work (he was in Beijing for The Grandmaster 3D launch)…but his wife Carina was there in his place, so that’s good. Despite Tony not being there, it was still great to see the Tigers together again, along with other former TVB artists from the 80s. Michael and Jamie are a lovely couple – congrats to them on their 25th anniversary (and happy birthday to Jamie as well)! Congratulations, Jamie and Michael. Have another happy 50 years together! Why Andy not bringing Carol to the celebration night? It could be he is overprotecting his wife and daughter. His acting talent is unbelievable, excellent! Michael miu still looks as charming. Michael Miu did a wonderful job in Line Walker…hope to see more of him…still as charismatic. I think out of the 4 heavenly kings, leon will be like Michael miu…still very much as charming. Haha so cute, Carina standing in for Tony as the 5 Tigers… what an epic pic! Congratz! hope many more years to come! cute couple! When I was in my teen, I used to like Kent, Felix, and Michael. Now, it’s Felix and Michael. It’s nice to see friends/co-workers reunion. Congrats to Michael and Jaime! Wishing you guys another 25th and more years of happiness!! Congrats to Jamie and Michael!! Did their son and daughter attend their celebration? They have beautiful daughter and handsome son!! they should make a five tiger movie again. … and thats why i love 80s and 90s stars than nowadays so called stars. bless them and wish evergreen Five Tigers always. … and see Michael n Jamie plus Felix n wife show whats the meaning of true love. BRAVO .. Agreed, support celebrities with character who don’t cheat/disrespect women. True Love & True Friendship. They all known each other for so long. Nice to see this them gather altogether. I agree with you and thinks that Michael being the eldest of the 5 tigers has aged the least. I have never really liked Kent Tong and thinks that when he was young and handsome, he was too vain. Now he looks awful I think and I never thought that he was a particularly good actor either.